This album definitely has more folk influence than his previous albums. 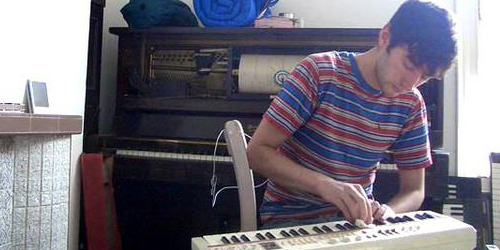 When I was playing “C & O Canal,” which is my favorite track on the album right now, one of my friends walked in and thought it was Sufjan Stevens… a comparison I can definitely see. This transition probably occurred after Vanderslice decided to take a minimalist approach and construct the melodies of his songs in a basement studio in his home, as opposed to his recording studio, Tiny Telephone. 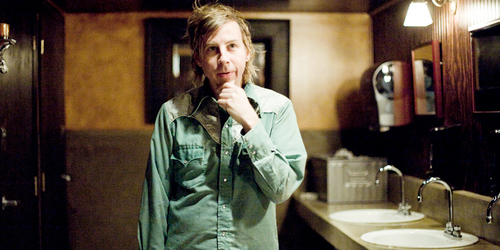 John Vanderslice is from San Francisco, and has been performing with his own band ever since breaking up with mk Utlra in 1999. He has his own record studio in San Francisco called Tiny Telephone, where he not only records his own albums, but produces albums for other artists, such as Spoon’s Gimme Fiction. Some other bands that have recorded there include: Beulah, Death Cab, Deerhoof, Mates of State, and the Mountain Goats, who John has done a lot of collaboration with. Romanian Names will be released on May 19th (18th in the U.K.). JV is going on a huge U.S. tour to support the release, and I highly recommend you see him live if you have the chance…he’s great (dates after jump). Free stuff is sweet. Free music is even better. But like, free-free, artist-endorsed free. Especially when it’s killer art-rock. Portland duo Experimental Dental School is offering their album Forest Field for free at their website here. Forest Field is like giving Deerhoof a more discernible goal while dabbling in the Blonde Redhead male/female vocal dynamic. It’s like Pretty & Nice’s Get Young in that it makes you think about what you’re listening to, with super dense guitar-rock arrangements; angular leads flying over-head while a revolving door of synth and bass pours out churning subsections. It’s a record to go insane to, it’s a record to fall asleep to, and it’s probably a record to make really awkward love to. “Square Wave Cave” progresses with an ominous guitar squeal reminiscent of Menomena’s “The Pelican.” As the fifth track on “Forest Field,” it acted as my first flashbulb moment of the night. The riff hit, the chorus sank, and something huge resonated. Two songs later, “Vicious Cycle of Life” opens with a sharp, arpegiated guitar and hushed female vocals. It’s the album’s only real come-down moment, before dropping into the reverbed drive of “Argentine Pears.” That resonance I mentioned from “Square Wave Cave”? It exploded with “Argentine Pears,” particularly due to the strange time and the chord change at 1:20. I’m a sucker for inexplicably captivating chord changes. I’m sort of writing this on the fly, because I don’t want to think too hard. I think it might permanently hurt my brain. Get into it. While I don’t consider myself an active listener of “World” music, one of my new favorite musicians has made me realize that I really need to explore this genre more. 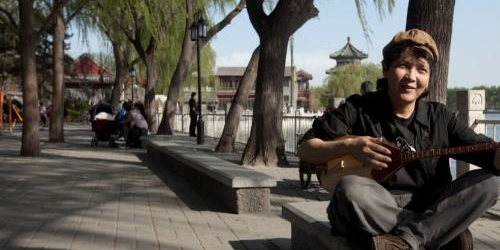 His name is Mamer and he is from Xinjiang, China. Some contributing musicians on his debut release, Eagle, include French composer Hector Zazou, a throat singer named Ilichi, Bela Fleck, and Mamer’s former band IZ. Fleck and Mamer play dual banjos on “Celebration,” and it’s pretty amazing. I can’t recommend this album enough. It’s soothing to the ears, original, and overall, just one of the most enjoyable albums I’ve listened to recently. 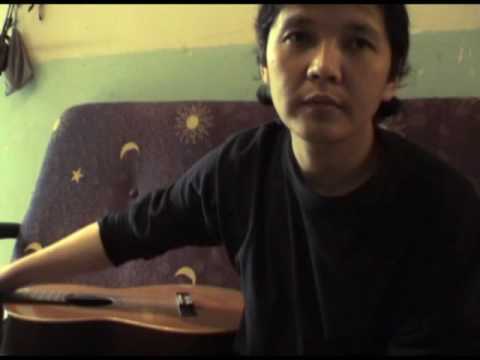 Mamer sings in the Kazakh language, so there is absolutely no way one who doesn’t speak the Kazakh language will know what he is saying (unless you hire a costly translator, which I strongly considered doing, but ultimately decided against). Eagle does not release in the UK until May 15th, but you can Pre-order from Real World Records (link above). If you are a fan of Jens Lekman, Ron Sexsmith, or Xiu Xiu, I highly recommend you check out the music of Sleeping States, which is the brainchild of musician Markland Starkie. Recently, I’ve been turning to his 2007 debut, There The Open Spaces, when looking for good music to chill out to. 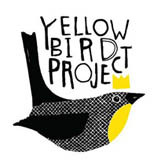 If you enjoy lo-fi, dreamy music, or music that has been influenced by knitting (see Myspace), this album has some fantastic songs for you to add to your rotation. Starkie is in his late twenties, and based in Bristol. Although There The Open Spaces is his main release, he started Sleeping States in 2004 and has released EP’s before and after the 2007 release. Sleeping States – Sleeping States, Or Who Has Been Rocking My Dreamboat? Passion Pit‘s “Sleepyhead” video was one of the cooler vids from last year (and Pitchfork endorsed!). Here we have the video for the new single from upcoming album, Manners. This song has taken some heat since it’s release, mostly because it isn’t “Sleepyhead.” And it’s tough not to compare the two. “Sleepyhead” was immaculate in it’s immediate, pop infectiousness and it was the world’s introduction to the band. Frontman Michael Angelakos’s falsetto was endearing and the backing story – that the entire EP was written as a valentine’s gift for his girlfriend – was adorable. “The Reeling” shows us a slicker, more-produced sound from a band introduced as a type of bedroom pop. Where “Sleepyhead” resonated immediately, “The Reeling” is definitely a grower. But for that reason, I’ve already become more fond of this track. And this video – beautiful girls literally tearing up a New York night – is the ideal reflection of their music. 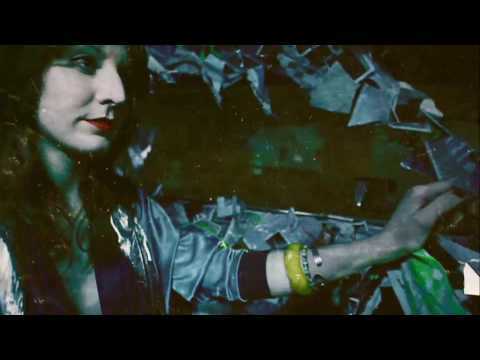 IndieMuse is psyched for Manners to drop, and until then will have to hold ourselves over watching this video on repeat. Jens Lekman has released a new single/video with the help of a (group? sham? new backing band?) 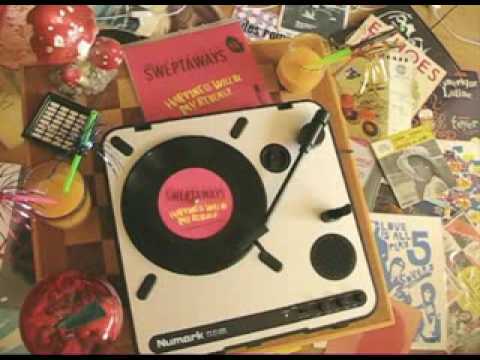 called the Sweptaways. I found it courtesy of the ever-wonderful I Guess I’m Floating. A few minutes of Jens riding sunny, chamber harmonies, crooning lost-love and dreams of eventual, emotional retribution. Sounds about right. I hope to see more from him soon, cause goddamn do I love me some Jens Lekman. Hey everyone, since I’m totally strung out in preparation for graduation, just wanted to give you a quick mix. I’ve been out for a bit, so I’m gonna give you the accelerated version. As I occasionally do, here’s a little stream-of-consciousness mixtape of my recent musical findings. First, from a fantastic compilation a friend of mine picked up in Northampton, just a slice from what is one of the grooviest collections of funk I have ever heard. Get it. Dance. Speaking of shameful neglegence–Midlake. Apparently, I missed out on these guys a bit at the time, but seriously… SO good. SO underrated. A brilliant compilation with emotion to be had from every performer. Probably the strongest attempt at getting so many popular indie artists together like this. I have no clue where this song came from but its texture gets stuck in my head. Hmmm…. this one is happier. Like… WAY happier. I mean, it has bells… as we’ve come to expect from these guys. Speaking of celebrating happiness, Wilco is always refreshing… and they never mind laughing at themselves. I’m unbelievably psyched for their upcoming album (*cross fingers* Late June), supposedly includes some form of this song. Can’t wait? Check out Wilco’s new DVD out now!!!!! Wilco keys player, Mikael Jorgensen, has his own thing going too and his influence is clear. Another band I feel is underrated, Akron/Family has been getting me anxious for their new album. On the local side, these guys have been making great music down the street, and I wasn’t hearing it. Thanks Brendan! As always, Passion Pit deliver with a bite from their upcoming. Here’s a solid 9-minute electro-journey to the inside of your brain. Grab a bunch of their stuff for free on MySpace. My Morning Jacket has been pumping out the soul on all cylinders recently. Remember, if you haven’t seen them live… do it. This is just a really great song. You got it right, Binky… you got it. Fact: Soul Sides is without a doubt the blog I could not live without.This trippy GEM reminds me of the score from Fantastic Planet. Stay tuned for more. I have a lot to tell you. Thanks for reminding me about this gem, Monique! 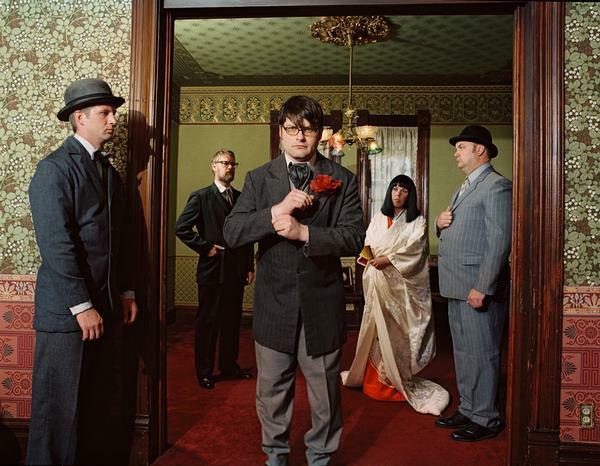 I first discovered the Decemberists when Picaresque went big. Eleven, self-contained pop odysseys, each one casting the previous in shades of grandeur I had yet to experience with music. (It didn’t help that it coincided with the heyday of my fantasy-novel indulgence.) I moved back from there, absorbing Her Majesty and Castaways and Cutouts, obsessing over the Tain EP and sort of enjoying the Five Songs EP. Listening to the Decemberists became an event, almost a hobby. They were something I could move to out of boredom, disappearing for ten minutes with the high-seas treachery of “The Mariner’s Revenge” or dissolving to the Fievel Goes West solo in “Chimbley Sweep.” So when The Crane Wife hit, and the brilliant pop songwriting behind “16 Military Wives” was replaced with twelve minute prog-rock escapades a-la Animals-era Pink Floyd, I was disappointed. And with Hazards of Love, they’ve further indulged their penchant for long-winded guitar solos and sparse riffage. The reason Picaresque was so absorbing was that the instrumentation propelled the story-telling. There was a give and a take between plot and musical action. As a whole the story is lost, and despite its concept album status and the high-arching, grand drama of the plot, it somehow lacks cohesion. It melds in controlled spurts, like on “The Wanting Comes in Waves/Repaid,” where Colin Meloy and some lovely lady trade dialogue over sharp, early seventies hard-rock riffs. But at the end of the album, I’m lost. 1)That Love is Hazardous. But vaguely so. 4) Chris Funk is still a guitar legend, despite any of the mean things I said above. That dude kills it. Jack White is terrifying. As always. Jack White continues to solidify his role as one of the most proflic figures in modern rock. He’s always creating, and never dissapoints. 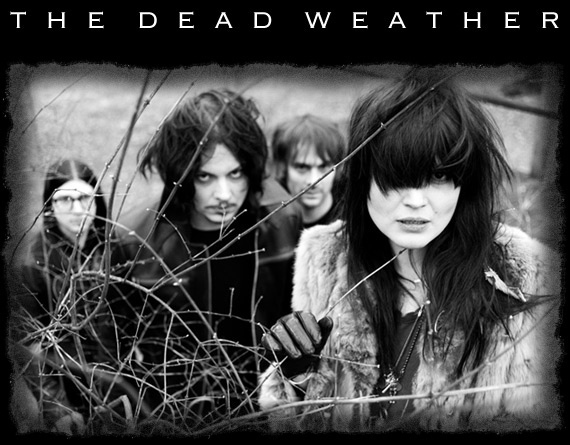 That being said, none of his divergences have ever quite lived up to the raw power of his White Stripes material, his new song under the name Dead Weather being no exception. For this band, White has teamed up with lead Kill Allisson Mosshart, Queens of the Stone Age guitarist Dean Fertia and Raconteur‘s bassist Jack Lawence. White plays drums and sings. Muddy, droning guitars back androgynous vocals (is it White or Mosshart? Whitehart? Mosswhite?) and a savage hi-hat attack, courtesy of White. For the time being, this’ll satisfy my Jack White intake. I’m still eagerly awaiting whatever he does as the Stripes next though. Stream “Hang You From the Heavens” here.